It's the golden anniversary of the Grateful Dead. 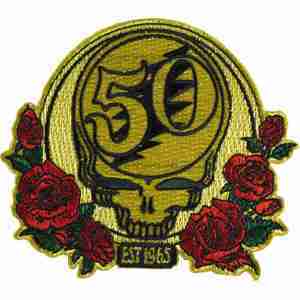 This gorgeous embroidered patch has gold glitter thread around the 50th anniversary logo with red roses. Patch can be ironed or sewn on. It measures approximately 3 1/2" x 3 3/4" and is officially licensed Grateful Dead merchandise.